My grandson loves homemade birthday cakes. Every year I ask him to choose what I make. Now, an avid fisherman, he chose a 20 inch rainbow trout for his 12th birthday. 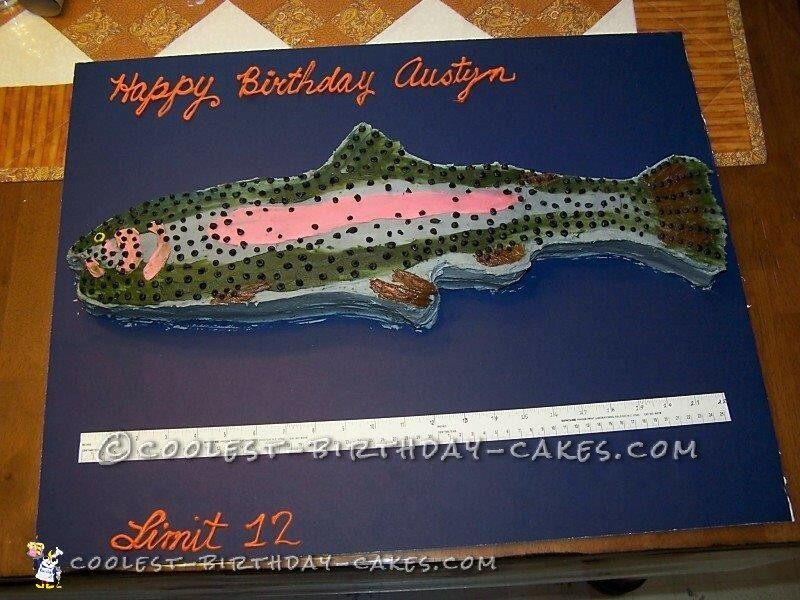 Yikes, a 20 inch trout cake! I had to think about this one. 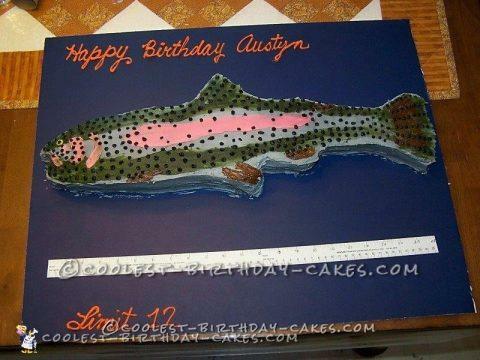 I decided to first find a rainbow trout on the internet. After I found just the right one, I printed it in color and enlarged the original until I had the correct size. I baked a chocolate cake and froze it. I cut my pattern off at the tail in order the cut the cake in two pieces to get my correct size. I bought a piece of blue poster board to place this large cake on. I cut the frozen cake along my pattern and placed it on the poster board. Now the frosting began. I used the colored print out to get the colors correct. I made my favorite 4H white frosting. Learned how to make it while I was a 4H instructor (however, not a cake decorating instructor). I made several bowls of the appropriate colors and began the task of frosting a rainbow trout. After I had my husband go to Walmart for a new mixer. Mine decided to die during the mixing of frosting. I frosted this trout with a base of chocolate and proceed to put the green, salmon and silver to create this masterpiece. I applied the appropriate speckles and placed an eye on this large trout. When I went to apply the ruler, I realized I had a 22″ trout! WOW!! We caught the BIG ONE! I brought the cake to our favorite pizza place for his family party and his eyes we huge when he saw this cake. He smiled from ear to ear and I knew that this grandma did great. He was as surprised as I was it turned out 22″. We put in twelve birthday candles, sang and he devoured a fish head! It was a wonderful success for me.